Mulch, Boiler Fuel, Biomass & Animal Bedding | Gruber Pallets Inc.
Gruber Pallets values environmental integrity and sustainability, therefore all wood waste is ground and recycled into reusable products. Learn more. We value environmental integrity and sustainability, therefore all of Gruber Pallets' wood waste is ground and recycled into reusable products. We strive to eliminate any contribution to land-fills so that we can help secure a better livelihood and future of our planet and future generations. Our mulch is ground up with a 2.5 inch screen to ensure that the wood particles are consistent and heavy and therefore less prone to strong Midwestern winds. We deliver in quantities of 45 and 100 yard loads. Please contact a sales representative for bulk pricing. Wood chips/shavings are great for animals because they absorb moisture and odors from the animal's waste between stall cleanings. 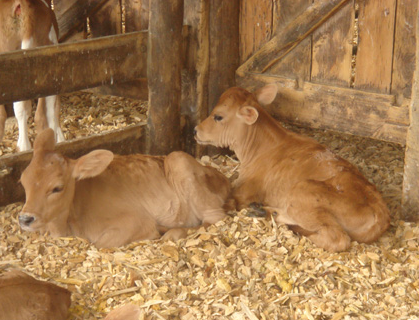 Animal Bedding also increases the animal's comfort when they are present in their stall. If the stall offers little room for movement, standing on Animal Bedding instead of hard surfaces for long periods of time can reduce stiffness in muscles and joints. We grind our materials using a 3/4 inch screen to ensure the bedding material easily clumps for simple routine cleanings. Click here for an animal bedding quote (45, and 100 yard loads). Biomass is fuel that is developed from organic materials; a renewable and sustainable source of energy used to create electricity or other forms of power. Our wood scrap based biomass is a cost effective absorbent solution for many application types. Click here to contact a sales representative to find out more information regarding pricing and bulk orders. Biomass is one of the leading sources of renewable energy along with wind, solar, and hydro-power.